I am currently in BC and the province has Canuck fever...so I can't help but follow the current playoff series against Nashville. I watch the games to see if I can see the infamous green men in the stands (no joke...I am uninterested in watching games of teams I am not cheering for). 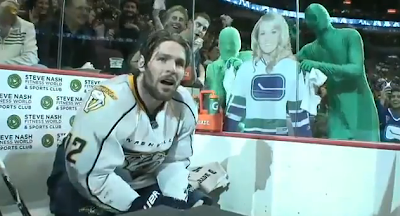 Tonight's game could have sealed the deal for Vancouver, but they came up short...probably because the Green men busted out this cardboard cutout again. Tisk Tisk. This is probably going to be my favorite still of the entire playoffs...husband and cardboard wife. Mike Fisher is definitely trying to ignore it.